TVB drama The Ghetto Fabulous Lady <福爾摩師奶> starring Adia Chan (陳松伶) aired its last episode on Friday, with the revelation of the drama’s final boss. 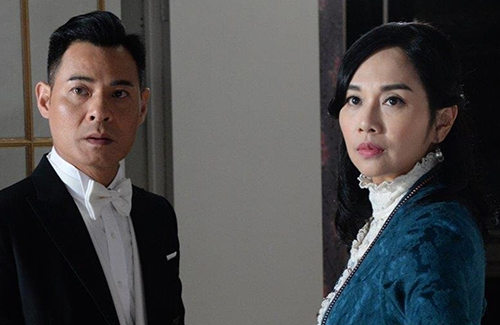 The drama, which is set in 1900’s Yau Ma Tei, stars Adia Chan as Judy Fletcher, wife of Lord Philip Fletcher, a “Sherlockian” character who is in the midst of solving a series of Jack the Ripper copycat killings that have been terrorizing the streets of Hong Kong. Prior to the broadcast of the last episode, it’s been known that the copycat killer actually comprises of several people, including Kwat Yat-fu (played by Ben Wong 黃智賢), Robert White (played by David Du 杜大偉), and Ngai So-ka (played by Jeannie Chan 陳瀅), but the original killer remains to be a mystery. Judy proceeds with the investigation of the copycat killer. With the true murderer of Ting Yuet (played by Wong Yee-kam 王綺琴) still at large, Judy at one point suspects her husband Philip and Dr. Ko (played by Gary Chan 陳嘉輝) because the killer had to be proficient in English with a medical background. Meanwhile, the citizens of Yau Ma Tei are dying from a mouse plague. Kwan Yat-fu, as the masked vigilante Swallow, uncovers the vaccine vials stashed away by Hung Choi (played by Joe Cheng King-kei 鄭敬基) and gives them away to the citizens. He reveals to the citizens that Hung Choi had been spreading the plague for business. Dr. Ko reveals in a letter read by Kwan Yat-fu confessing that he was the first copycat ripper and was the true murderer of Ting Yuet. He had accidentally given Ting Yuet an imperfect version of his mouse plague antidote. In their altercation, Dr. Ko had accidentally killed Ting Yuet with his surgical knife. He then cut opened Ting Yuet and removed her stomach and intestines to destroy evidence of his illegal human experimentation. Ashamed of his actions, he commits suicide by hanging. Jeannie Chan escapes prison and brings Hung Choi with her to prevent him from further harming the citizens of Yau Ma Tei. She locks themselves inside a storage house and lies to Hung Choi that she had swallowed the door key. He cuts her open in hopes to retrieve the key, but is left with nothing. Her corpse attracts a hoard of infected mice, ultimately killing Hung Choi. What are your thoughts on the final episode? This sounds…really morbid & dark. Jeannie Chan got cut open. What a way to die.